Natures Menu Cat Food is a Complete & Balanced Natural food available in a variety of flavours, that is Highly Palatable & Nutritious. 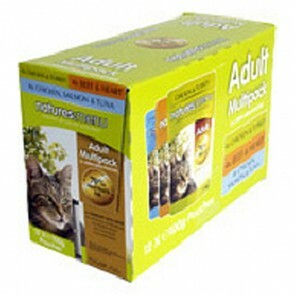 Natures Menu contains the correct balance of vitamins and minerals to help keep your cat healthy & active. Made with 70% real meat, Natures Menu is Free from; Artificial Colours, Flavours and Preservatives. Natures Menu Products are designed to meet your pets requirements by using only Naturally Balanced Raw Materials, unlike other over processed pet foods, that use Chemicals, Additives & Preservatives. For further information regarding Natures Menu Products please click here! Foils & Pouches: 5 stars out of 5 based on 0 user reviews.